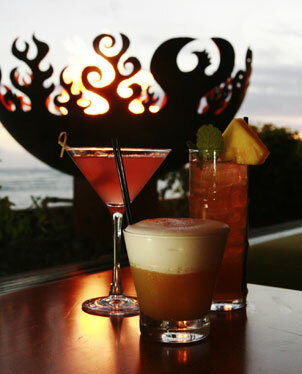 A few of the drink offerings at Rumfire include Tradewinds, Deconstructed Pina Colada and a 1944 Mai Tai. Where Starwood ventures, a certain amount of cool follows. Up until a few months ago, I couldn't conceive of the Sheraton Waikiki as being a destination beyond the occasional weekend banquet/fundraiser, when organizations and bridal parties require a big ballroom to contain guests. Hours: Lunch 11:30 to 3 p.m. and dinner 4 to 11 p.m. daily, with happy hour 4 to 6 p.m. daily and late-night cocktails to 2 a.m. But sure enough, and little by little, Starwood has brought a bit of swagger to a property that never sold thrills before. 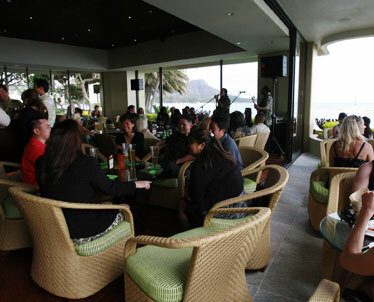 The cool crowd can now be found at Rum Fire, where the Esprit Lounge used to be, at the beachfront. What a transformation it has been. The enclosed box of a room is gone, replaced by openness and sparkling glass that reveal the million-dollar view of Diamond Head beyond the glow of the room's glowing fire pot. I can't believe they hid this view before. Duh. People pay thousands of dollars to fly here for this. And what's that I smell? Aromatherapy candles fill the air with soothing scents, the perfect antidote for a bad day or, in my case, the past three hectic weeks. Sit in this room at sunset and all trauma will drain away, with or without the assistance of Rum Fire's signature rum cocktails. They don't skimp on the rum here, whether you're ordering a daiquiri, froufrou piña colada or mai tai. When you do get hungry, great selections abound. I was a little skeptical that a place as trendy as this would be able to put out decent fare. Over the years I've come to associate "trendy" with "hyped" and, basically, food for lambs who aren't particularly discerning. Hence, my hesitance to check it out. Prices were another issue, set at about $11 to $16 per appetizer. You might want to get here for happy hour from 4 to 6 p.m. when there are half-price drink and food specials. Otherwise, in this economy it seems that people have to choose one or the other, with many opting for the liquid diet, plus garlic or smoked sea salt fries at $6 a pop. IF YOU OPT for food, you will be pleasantly surprised. Although basic barbecue, hoisin and sambal sauces accompany many dishes to accommodate the drinking crowd, there are enough flavors and textures within the food to thrill a foodie. It's a remarkable balancing act for two distinct groups of people. Executive chef Colin Hazama -- an alumnus of Alan Wong before furthering his education in San Francisco and returning to work at Hoku's the past three years -- is definitely someone to watch. Reading the menu offers no clue to the menu's playful originality because it all sounds local generic. Take the fire-grilled mahi tacos ($15). Almost every family restaurant has a fish taco. Ho-hum, right? Not here, where the presentation is half the excitement. The elements are presented in a build-it-yourself format with flour tortillas presented in a glass, alongside small helpings of ginger-mango relish, and guacamole spiked with corn and cilantro, with the fish sitting atop shaved won bok slaw. Call me a cynic, but a lot of times when I see food for show, it disappoints because advanced prep and playing with the food does take a toll. Here, everything was perfect. We had already gotten off to a good start with a special of hamachi sashimi drizzled with a cucumber-lavender gelée, with a soothing herbal, floral flavor and the bite of wasabi relish (watch out for those stems and leaves that look like capers). Figuring most people would be picking at food here, we also went for the ahi poke Rum Fire style ($15). 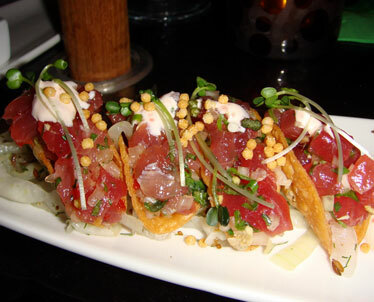 The small dice of ahi was loaded into small taco-shaped tortilla shells, layered with Maui onion and tobiko sour cream, with a helping of gingered avocado guacamole on the side. All of it was sitting on a crunchy bed of Maui onion sauerkraut with shaved fennel. There always seemed to be a lot of stuff on the plates, but none of it was extraneous or an afterthought. In comparison with other dishes, lettuce wraps ($12) with a filling of ground chicken were rather plain, so didn't get eaten. I took them home as leftovers, where, without the other showy dishes around, I could finally enjoy the subtle crunch of celery and water chestnuts in the mix. The Indian curry pot ($14) is intriguing but a trying dish under social circumstances with its many parts intended to be mixed and matched: roasted vegetables prepared "vadouvan" style, described as a French-interpreted fermented Indian curry mix, jasmine rice, chutney and grilled papaya. This has the heft of a dinner entree, along with dishes such as butterfish misozuke ($22) and grilled filet mignon ($29). Let's not forget the cast-iron-seared scallops, costly at $18 for a trio but served with crunchy slivers of Asian pear and hearts of palm, and perfectly seared without the water bloat of scallops served at other restaurants both high and low. It doesn't get much better than this. The dish emboldened me to come back later for the crab cakes ($16). I'd given up ordering them about a year ago because they always came up short compared with those I've had in Seattle and Maryland. Here, they come in smallish pairs, but the crab meat is excellent and plentiful, without the usual fillers. These are served with a palate-cleansing icy and refreshing lemon verbena mojito shooter. Do not mix the two or you'll bury the flavor of the crab. A bunch of rum-filled desserts follow, but by that time I think most people would have to be cut off.